Too often, email marketers work with blinders on. 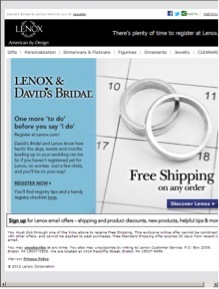 They focus on a single email campaign and then move on to the next one. However, it often makes sense to take the “big picture” approach to email marketing. In the end you are just trying to reach you email marketing goals. So it makes good sense to take a good look at your current campaigns and see which you can get more mileage out of. Although reminders do work, I am not only talking about a free shipping email, followed by free shipping reminder and free shipping last chance email. 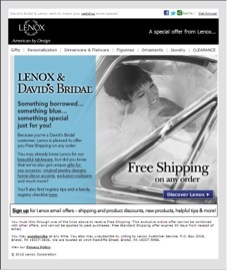 It is those triggered emails that maintain communication with subscribers at various touch points. Let’s look at a few examples. They say that first impressions count, and this is true in email marketing as well. Setting up an autoresponder to acknowledge when someone subscribes to your email list is a good practice, but you really need to roll out the red carpet for new subscribers. If your focus is solely on acquiring new email subscribers but not on activating them, you’re defeating the purpose. 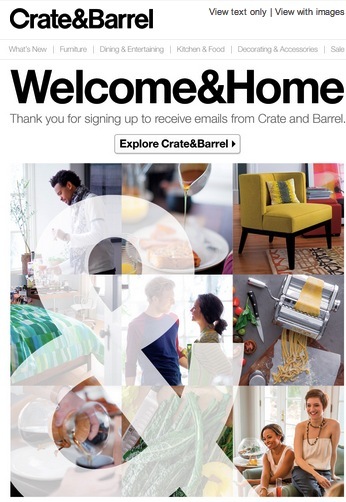 Welcome emails give you a chance to introduce your company to your subscribers. 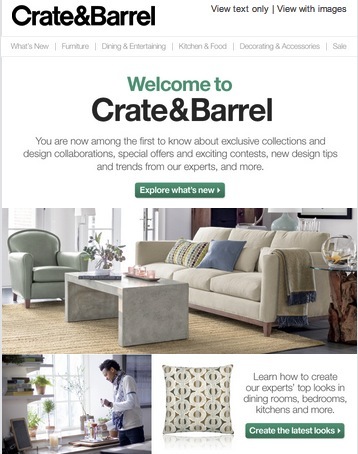 Crate & Barrel does an outstanding job of showing new subscribers what they’ve got to offer. The first email in the series is simply a thank you with lots of visuals and a huge ampersand – emphasizing the “&” in its name… and building brand recognition. 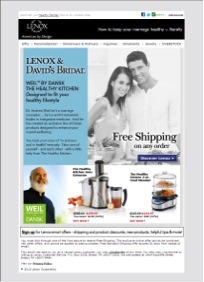 The imagery includes people as well as products, which serves to humanize the brand. 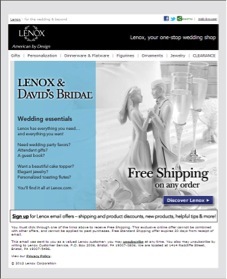 The second email in the series continues to emphasize the “&” concept, this time with an animated gif for the headline. 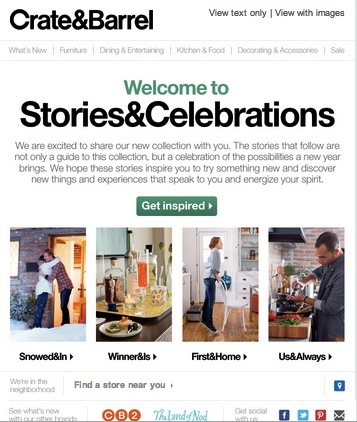 The copy for the headline changes from “Crate & Barrel” to “Sneaks & Peeks,” “Ideas & Inspiration” and “Surprises & Smiles.” Gotta love it. Although not everyone will see the animation, animated .gifs can be a real eye-catching use of images in your email newsletter. A human element is included, if you look closely it is the same guy as in the first email! 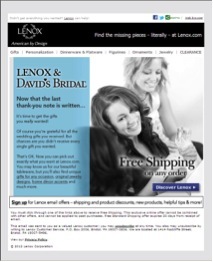 Further down in the email are opportunities to connect with the brand via social media – Pinterest, Facebook and Twitter. That way they are building up their fans and followers via email. The third email in the series is also consistent with the “&” theme. You can see that the explore / get inspired is a recurring message and call to action. Here, the copy is slightly longer. This one goes into stories that subscribers can relate to, no matter what their stage in life. 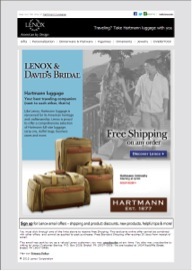 It is important to get that brand building content in your email campaigns right from the start. OK, so you don’t speak German. 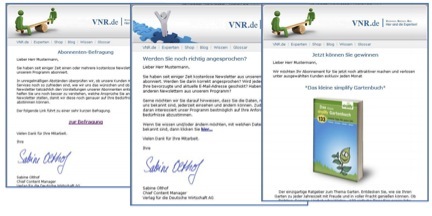 You still can appreciate the strategy behind these re-engagement emails from VNR.de. I personally don’t like stocky looking imagery, but what they did very well is using it as a series, good enough to win a Marketing Sherpa award. Email addresses that showed no activity for the last 120 days were targeted. The campaign lasted 60 days and includes a questionnaire, a request to check data, a lottery, followed by another data check request. The result? VNR reactivated 9 percent of the email addresses. And for a reactivation campaign that is pretty impressive. If your product or service is related to anything that involves life stages, you need to set up an email stream based on where your subscribers are in the process. Examples include applying to college, moving/buying a home, having a baby, raising a child, car or appliance maintenance or planning a wedding. By sending emails over an extended period of time, you ensure that your company is top of mind – and at the top of your subscribers’ inbox – throughout the process. One data point, like a wedding date can be the focal point for a lot of value adding trigger-based messages or autoresponders. In that way, it is a lot like behavioral email marketing. Perfectly timed. 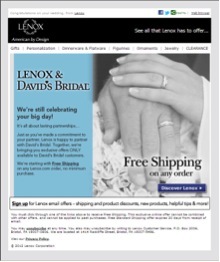 This series of wedding emails from Lenox illustrates that you can continue the conversation after the event has passed. Got the wedding gift blues? In short, don’t be afraid to reach out to your subscribers with multiple emails. Have a look at your average email open rate. 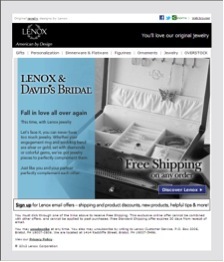 Do you think your subscribers open and read every email? Chances are your subscribers will be thankful you did. Otherwise, they may think you forgot about them altogether. A word of caution, keep an eye on your unsubscribe rates. 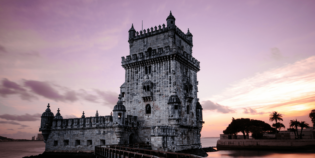 Develop a strategic plan for your triggered messages, and you’ll realize the benefits over the long term. How many emails do you send to your subscribers on average?